Stitch Fix is an online styling service that delivers a personalized shopping experience, just for you. Fill out your Style Profile and a personal stylist will hand pick pieces to fit your tastes, needs, and budget—and mail them directly to your door. Each box contains five items of clothing, shoes, and accessories for you to try on at home. Keep what you love, send the rest back in the prepaid USPS envelope that comes in your box. Shipping and returns are free—even for exchanges! At the time your Stylist selects your items, you will be charged a $20 styling fee. That $20 will be applied as a credit toward anything you keep from your shipment. Take three days to try the clothes on, decide what to keep and what to send back. Choose how often a box is delivered when you sign up for Stitch Fix. Sign up for a monthly box or order a box whenever you want one. 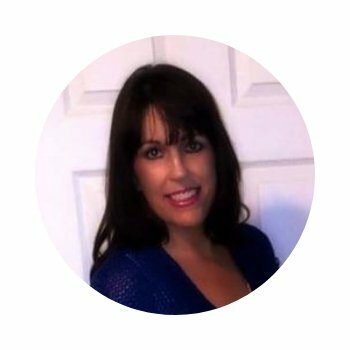 Your Stylist will go by what you put in your profile and by any of the notes you leave about what you want each month. You can help your Stylist even further by linking a Pinterest board to your Stitch Fix account. I have one called “My Style”. You can call yours whatever you want. I also send my Stylist the urls to the pins of items I see on Pinterest that I really like. My Stylist Brittany is awesome at finding me the things I really want! If she can not find the pieces in the pins I send her; she comes super close, or she finds even better pieces. Well, enough of all the chit chat! Come and see what I got in this box! 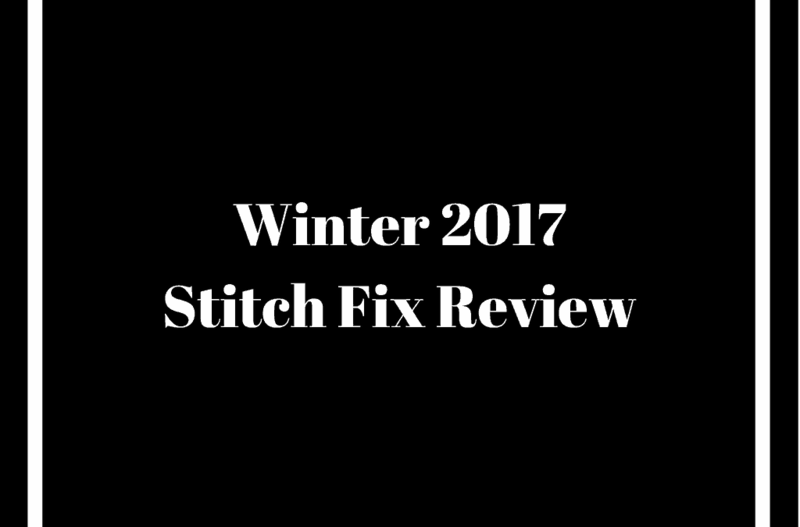 This was such an excellent Stitch Fix box! 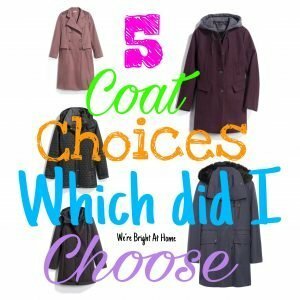 Brittany sent me different styles of coats for me to try on. All I knew that I wanted was that it had to be warm, not too bulky and it had to have a hood. I wanted the hood to have faux fur if Brittany could find it. 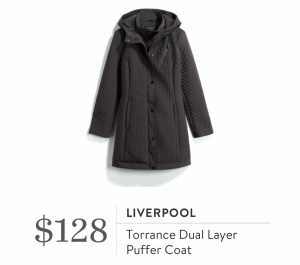 This was one of my favorites, the Liverpool Torrance Dual Layer Puffer Coat. I usually do not like puffer coats. This one was not puffy at all. I really liked this one. I tried it on with a sweater, boots and dress pants. The coat fit well. I tried it on with some athleisure pieces. That looked nice as well. I love how versatile this coat is. This coat was in the running for me to keep. It had everything I had asked for. I have had a lot going on for the holidays and did not have time to take a picture of me wearing the coats that I sent back. I will do better next month. Promise! I love the look of this one! It has the faux fur hood I had requested. The hood is detachable. I love the sophisticated look. Unfortunately, it was more like a thinner type dress coat. It was not good for layering. I would have considered keeping this coat if I could wear layers under it. Returned. 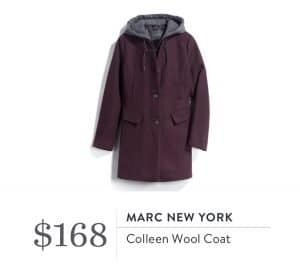 The Marc New York wool coat in burgundy is versatile and can easily be dressed up or down. I like the laid-back look of this one. I love that the hood can be taken off if I want to dress up. This coat was a little too plain for me. The price was steep for how plain it is too. It was not as warm as I needed it to be either. Returned. I am going to be honest here; this coat is not my style. The mauve color and the lace on the shoulders are not my style. The buttons are cheap plastic. There is embroidery on the back of it. 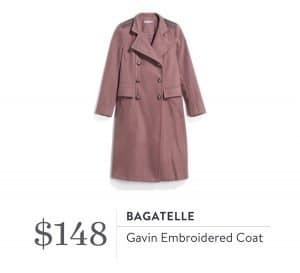 The price point is too much for what you get in this coat. I just do not like it. Returned. This coat is one of my favorites! I like that this coat is light weight. It has pockets inside and out. It has a big hood that can be taken off. I love it! Brittany, as always, has gone above and beyond for me, to find some great coats for me to try on. Which one did I choose? 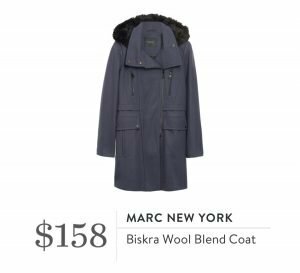 It came down to the two puffer coats, the Liverpool Torrance Dual Layer Puffer Coat and the Marc New York Savana Quilted Puffer Coat. They are both very versatile that can be dressed up or down. They both had detachable hoods. The price points were good too. 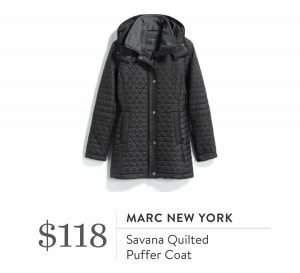 I chose the Marc New York Savana Quilted Puffer Coat! I like that it has a gray collar coming out of the black coat. The waist is adjustable. I love the fit of it too! Well, that’s it for this Fix! I got two more Stitch Fix boxes for the month of December. Be on the lookout for reviews on those boxes. Click here to have your styling fee waived on your first Stitch Fix box!